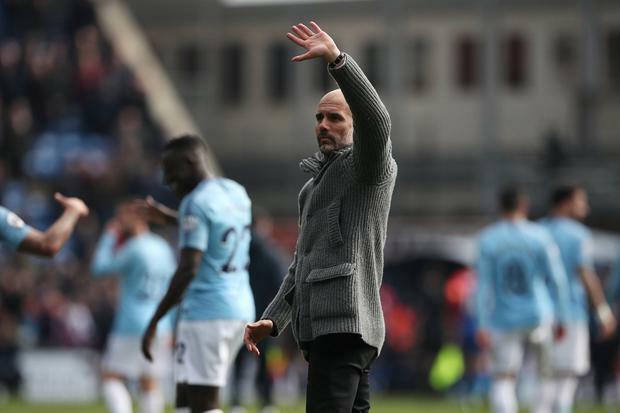 Victory over Crystal Palace was City's ninth league win in succession, but Guardiola was in no mood to celebrate, warning his players that they cannot afford any slip-ups. They face Tottenham Hotspur and Manchester United in their next two league games. "The Premier League is still in our hands," the City manager said. "We have to win every game if we want to make back-to-back titles. The players have shown they want to do it. No doubts. "For a month in the Premier League, we knew it would be almost impossible - possible, but very difficult - if we dropped points. We've played with incredible personality in all the games, including Champions League games. "We've had 183 points in two seasons with five games left. Those are incredible numbers." Guardiola was impressed with how Raheem Sterling, who scored twice, reacted to his early miss. "His miss at Burnley last season was worse than today," said Guardiola. "Mentally, in football, the most important action is the next one. If you miss, you have to get over it and finish the next one."